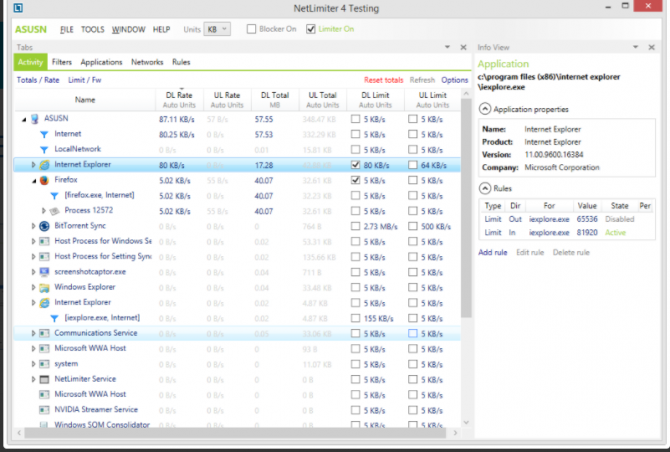 Windows Resource Monitor gives an overview of how much network bandwidth each application is consuming. These are basic stats and limited to that particular session. If you are concerned about which applications in your computer are taking the most Internet bandwidth, you should check this article. In this article, we will talk about the tools to check Network/Internet bandwidth usage with respect to each application open in your computer. NetworkUsageView is a free tool which helps you in viewing your data usage for every application which you are using over the internet. It shows you the data usage of past 1 hour, past 7 days or for any particular day. Basically, it extracts the network data usage from SRUDB.dat database of Windows 10 and shows it to you. it collects the information hourly and shows it to you. It shows you other information of each app like the name of the app, id, timestamp, network adapter name etc. 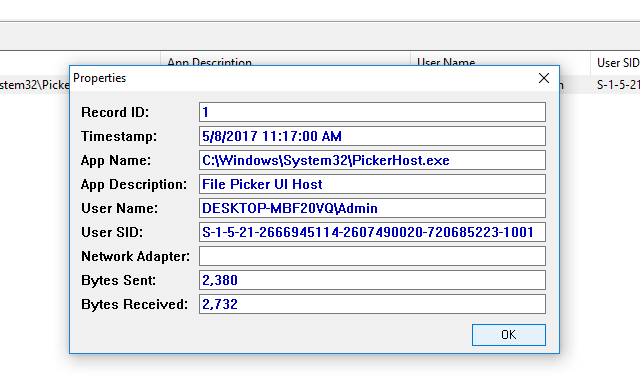 Open the installer and install the tool on your system with on-screen instructions. You have to run it with as an administrator, otherwise, it won’t show any data usage for any app. The main window of the tool will look like this. And it is showing me the applications most recent one which I am using on the internet. Now if you want to see how much data in bytes this app is sending and receiving, just right-click on the app and go to its Properties. A pop-up window will appear that shows you the detailed information about the selected app. As I have installed the tool now, and it is showing me data usage of my apps from now. But if you want to check the data usage of a particular app from an earlier period, you can check it by going to Options –> Advanced Options. A new window will open from where you can select the preferences that for how much days you want to check data usage for each app. In the Advanced Options, you have 3 options more that from where you want to calculate the network usage, from your system, from an external SRUDB.bat database or from Remote Computer. To compare results of data usage of apps, you can save the result in a TXT, CSV, HTML, or XML file format, by going to “File” menu then go with “Save selected item”. This will help you in analyzing network data usage for any app that how much it is using your data before and now. A Quick Filter feature is available in View menu, that helps you to quickly find something in the tool if you have too many apps in the list, so just enter the keyword or relative column which you want to search. NetBalancer is a tool that calculates the bandwidth or network data usage of your system and helps you in balancing your network data usage. It is a freeware tool. If you have multiple systems and want to calculate bandwidth for each machine, then you need to install the tool separately on every machine. When you install the tool, the main window will look like this. And it shows all the apps on your system with their network activities. If one of your apps need to have high priority, you can set its priority high and make the priority of other apps low, according to requirement. 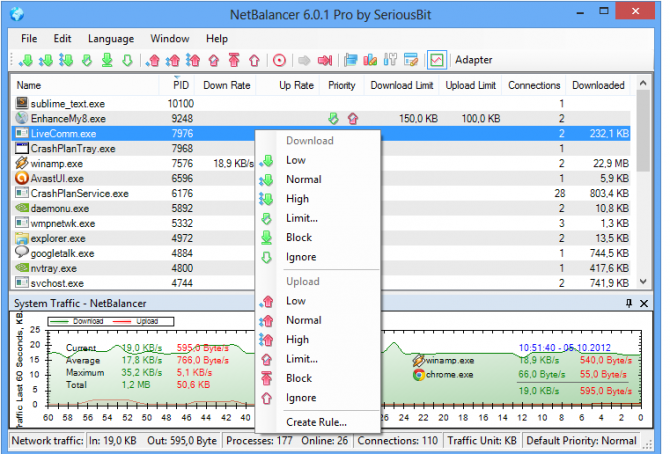 To make your internet traffic smooth, set traffic rules with the NetBalancer. It is easily accessible from Windows tray. There are different parameters which can show you network traffic. Set in MB, GB or KB. Set in MBs for convenience. 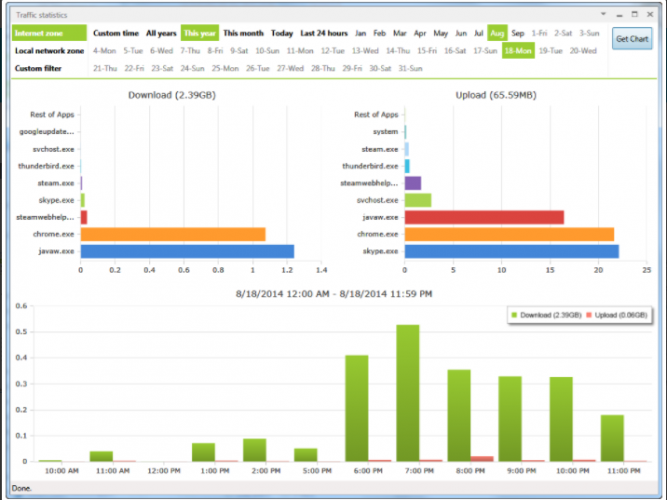 NetLimiter is another tool that monitors the Internet traffic and controls the network data usage. You can monitor data usage for each app individually easily with it, this will help you in managing the network data usage. NetLimiter is for Windows Operating System. Download it from here and run the installer to install the tool on your system. To make your network usage more useful and productive, you can apply different custom filters. If you want to view data usage of past day, past month, past year or 2 years back, ou can easily see it through NetLimiter tool, this will help you in comparing the data usage of the different time period. 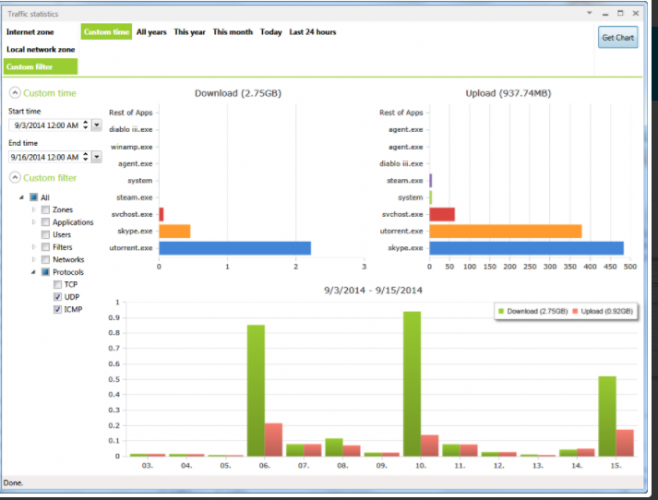 Analyze each application of your system and checks how much it is consuming your network’s data. The good thing about these tools are, they can show you the result of any app from how much longer you want to check. With analyzing of network data usage, you can easily control your data amount for any app and can decide how much usage you have to spend for any app. Can you please tell me in how many different ways internet bandwidth usage can be monitored over a network ? That really depends upon what you want to achieve from your monitoring.